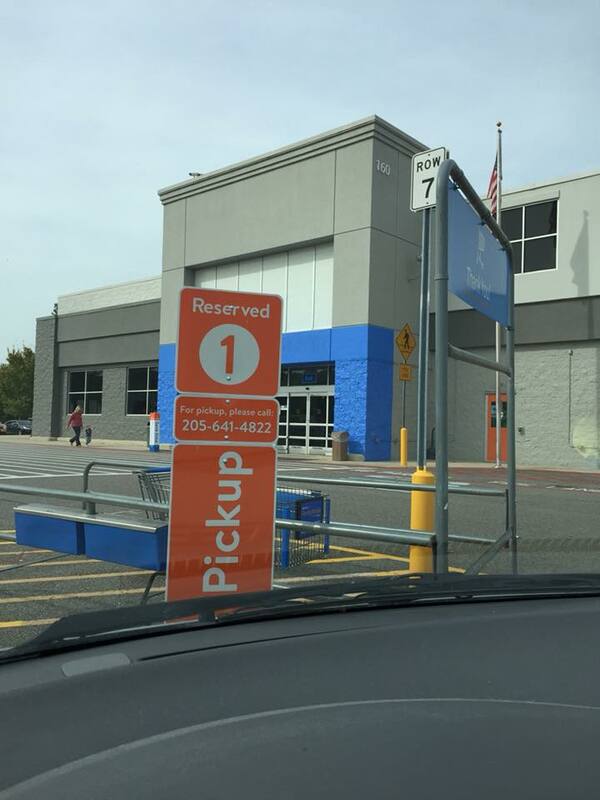 Walmart’s Online Grocery Pick Up has come to SPRINGVILLE! Save $10 on your first Order! Walmart stores in Leeds, Trussville, Hwy 280/Inverness AND NOW SPRINGVILLE have online grocery pickup. I just used Springville’s Pick Up today for the first time. Springville’s service is top-notch! This one might become my go-to regularly if they keep up this level of service. I’ve got a link for you to get $10 off your first pick up order of at least $50! Click here to get a code for $10 off your first order to save time and money! 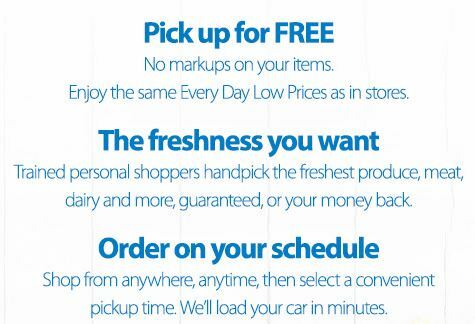 There are ZERO additional fees associated with Walmart Grocery Pickup!! I like to purchase store brand items, things I don’t have coupons on and items I know Walmart has a good price on. 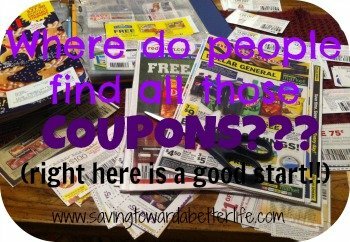 So even without “coupons” I feel like I still did a good job saving! Plus, with $10 off your first order – that’s just $10 in FREE groceries! Plus, with my first order, I got a cute bag full of free items! 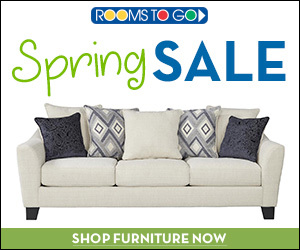 $10 savings and free items! Why wouldn’t you try it?? Place your online grocery order and save $10 off your first order of $50 or more! Click here to get your $10 off code and get started! How does it work? Order online, set a time to pick up your order, and they bring your order right out to the car to you! You can schedule a time to pick up your groceries! They do they hard part! You can’t use paper coupons or grocery cash back apps. You currently can’t use Walmart’s Savings Catcher after your purchase for savings! Don’t try to tip the people who load your groceries. It’s not allowed. Some complaints are that it’s hard to get a pick up time because they fill up fast. That means the service is popular, which is good! 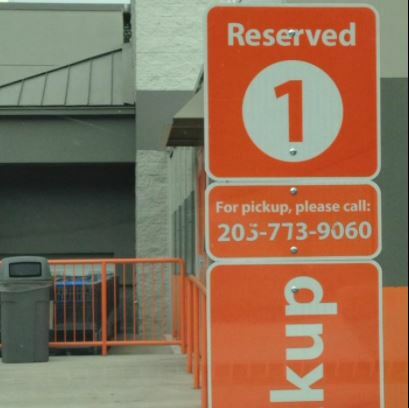 They will adjust the supply to meet the demand – they will open up more pick up spots! You can plan your order days in advance! As long as you pick your time and add at least one item to your cart, it will hold your spot. It will give you a deadline to complete your order (usually about 12 hours or so before your scheduled pick up time). You know how you go to the store and get a ton of stuff and come home and realize you forgot one thing? Yeah, treat your order like that – add everything you THINK you need and you’ll have about a day to add those things you forgot! I purchased store brand items, things I didn’t have coupons on and items I knew Walmart had a good price on. So even without “coupons” I feel like I still did a good job saving – and on top of that I got $10 off my first order! Click here to get a code for $10 off your first order to save time and money! You will be issued a single use code to use at checkout to get your $10 off! Plus, I got a cute bag full of free items when I picked up my first order! 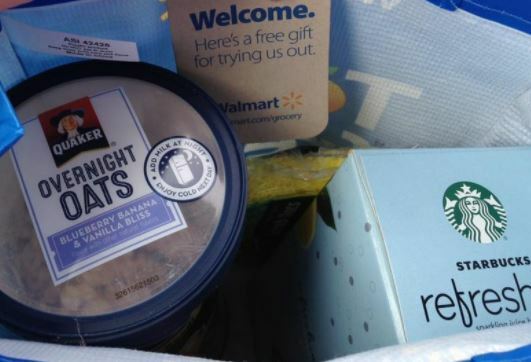 Try Walmart’s Online Grocery Pick Up and Save $10 on your first Order! I’ve used this myself a couple times. It’s great when you’re busy or, as many people are pointing our right now, you don’t want to catch the flu from walking around Walmart! We’re all looking to save a little money too, so I say it’s worth it to try it at least ONCE so you can save $10 off your first order. I mean, that’s just 10 free dollars you’re missing out on if you don’t do it. 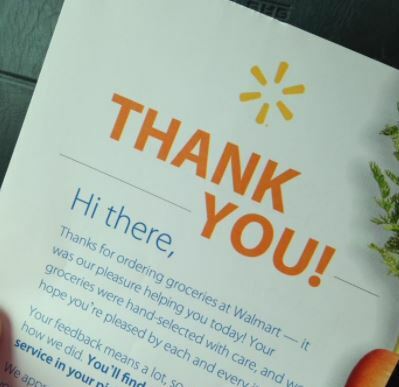 Walmart stores in Leeds, Trussville and HWY 280/Inverness have online grocery pickup. Springville will be launching online grocery pick up in SEPTEMBER! You CAN still use Walmart’s Savings Catcher after your purchase for savings! Try about 2 days out to “start your order”. As long as you pick your time and add at least one item to your cart, it will hold your spot. It will give you a deadline to complete your order (usually about 12 hours or so before your scheduled pick up time). You know how you go to the store and get a ton of stuff and come home and realize you forgot one thing? Yeah, treat your order like that – add everything you THINK you need and you’ll have about a day to add those things you forgot! Instacart Grocery Delivery Available in St. Clair County! 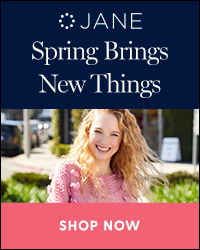 Get $10 off your first order! Instacart IS available near you! Odenville, Argo, Margaret, Trussville, Moody, Leeds, Clay, Argo, Irondale, and MORE Birmingham-area zip codes can get grocery delivery from Instacart! How Instacart works: Customers go online to www.Instacart.com (<<– This link gets you $10 off!) or open the Instacart mobile app (be sure to use code THANNER132 if you sign up through the app to get $10 off!) on their iPhone or Android device, select their city/store, add items to a virtual cart, then choose a delivery window (within one hour, within two hours, or up to seven days in advance) and check out. An Instacart shopper accepts the order on his/her smartphone, uses the Instacart shopper app to guide them through shopping, and then delivers the order to the customer in the designated delivery timeframe. My groceries were brought right to my front door. It was fantastic! Plus, if you SIGN UP NOW – I have a gift for you! $10 off your first order of $35 or more AND Free Delivery on your first order! You also have the option to sign up for a free trial of Instacart Express where you get free delivery for 14 days. Prefer to avoid delivery costs and tipping the employees? Walmart has Online Grocery Pick Up! Find out more about that HERE and get $10 off your first order also! You can still use Walmart’s Savings Catcher after your purchase for even more savings! 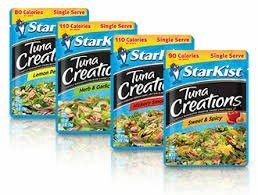 I love these tuna pouches for quick and easy lunches! 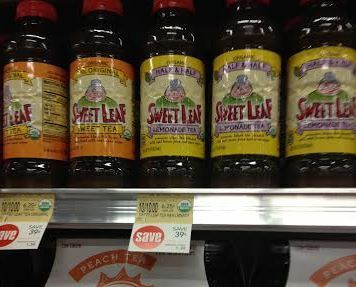 Right now you can get them for more than half pff at Publix! Check out this Kotex deal at Publix too! *HOT* Aldi Deals: $.69 Eggs, $2.49 Milk and more! I love shopping at Aldi! There isn’t one in St. Clair County (though I wish there were!) but the one in Trussville in the KMart shopping center on Chalkville Mountain Road is convenient enough and always worth the trip! I was just in there TODAY (5/1/16), and was excited to see that the price of eggs and milk had dropped! Milk is always in my shopping cart when I stop at Aldi! Red Grapes $1.98 for 2 pounds! (The picture is an older picture which is why it’s showing milk at $2.89). I have no idea how long these prices will last. This week’s ad runs until Tuesday so I assume you have until at least then to grab these super price! If you’ve never shopped at Aldi before, read why shopping at Aldi is different from other stores. I had some time last night to browse Publix and I found these deals you might be interested in! 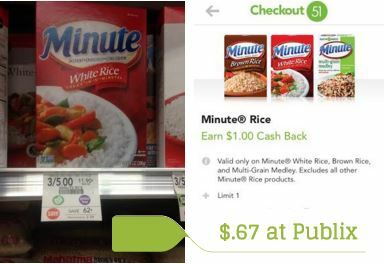 Here are 6 deals that will get you $5.30 in cash back! 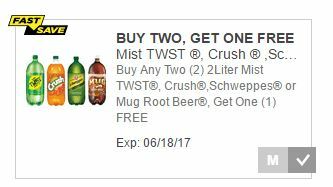 And 5 of the deals don’t require additional coupons so you can grab them at the store RIGHT NOW. The last deal that does have a coupon is still a pretty good deal with the sale and cash back even if you don’t have the coupon! And don’t forget, the Ibotta rebates will also count toward your February bonuses which will give you even more money! And don’t over look these rebates! I admit, I’ve scrolled past them because of the beer but when I accidentally clicked on one, it says NO BEER PURCHASE REQUIRED. Of course, they would like you to purchase the beer and maybe you will BUT to get the rebate you are not required too! 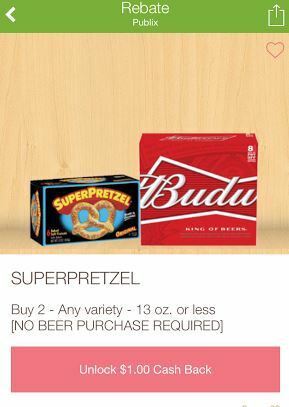 $1.00 cash back from Ibotta =$1.19 for both – just $.60 per box! And be sure to follow my other blog Saving Toward A Better Life for more deal updates like this!